Annabel Siteman was born on December 26, 1894 in Lower Ship Harbour to John Oliver Siteman and his second wife, Sarah Catherine ‘Carrie’ (Henderson). She had one older half brother, Hugh Fraser Siteman (1883-1956) who lived in Massachusetts and with whom she often corresponded. He was her father’s son from his first marriage to Susan Palmer whom he had married in 1881. John Siteman married Sarah Henderson of Toney River, Pictou County on December 7, 1893. Annabel attended the Provincial Normal College in Truro c. 1910-1912 where she studied to be a teacher and appears to have later attended school in Halifax c. 1914. She taught for a time, with one of her first teaching posts being at Lower Lakeville in 1912 and later Necum Teuch in 1915 where she may have boarded with Mrs. Walter Smith. She also later worked as a civil servant at the Federal Income Tax Department in Halifax, during which time she seems to have shared an apartment with her friend Peggy Richard Standring. She also provided research services for people from all over North America who were tracing their genealogical roots back to Nova Scotia. Annabel married Joseph Edward ‘Eddie’ Ells at Halifax on September 18, 1944 when she was forty-nine years old. He was born in Kingsport, Kings County and had come to Halifax in 1920 where he had worked as a chartered accountant ever since. Annabel had been good friends with Eddie and his first wife Lillian Genge prior to Lillian’s death in 1943. The couple lived on South Street in Halifax and had no children but enjoyed the company of several beloved cats and spent much time at their house in Ship Harbour, which had been Annabel’s childhood home. Eddie passed away on June 13, 1964 at the age of sixty-five. Annabel passed away in Halifax on August 7, 1969 and was buried at St. Stephen’s Church in Ship Harbour. Annabel Ells was the first historian and genealogist of the Ship Harbour area and spent many years at the Public Archives of Nova Scotia, researching and transcribing documents related to the Ship Harbour area and those who resided there, particularly the Siteman family. It is the largest known research collection of its kind on the Eastern Shore. She also conducted research related to Pictou County, where her mother was originally from. In the days before microfilm, she would make exact transcriptions of the material she found and then sign and seal them as being valid, accurate copies. The material that she collected and created is a major source of information concerning the familial and economic history of Ship Harbour. Although it would appear that she was gathering information and conducting research with a purpose in mind such as a publication on the history Ship Harbour, she never did create a written work based on the extensive information that she had accumulated. She merely assembled a vast body of material that already existed in the provincial archives. Annabel's research and records serve as valuable sources of information for genealogists and historians who are interested in the Ship Harbour area. Robert Kim Stevens referred to her research as a resource for his writing as did Agatha (Palmer) Ganong when she wrote her history of Ship Harbour. 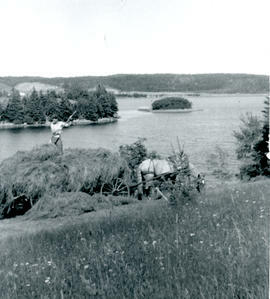 The Annabel (Siteman) Ells fonds was donated to the Public Archives of Nova Scotia following Annabel Ells’ death in 1969 and continued to be housed there until its transfer to the Eastern Shore Archives in March of 2011. The fonds consists of records accumulated by Annabel (Siteman) Ells during the course of her research on the area of Ship Harbour and the families who lived there as well as personal records created and accumulated throughout her lifetime. 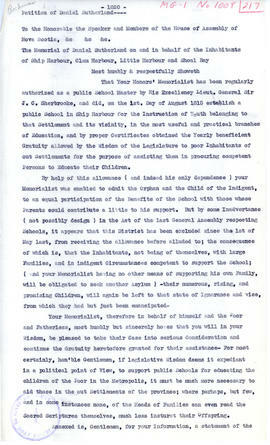 The fonds includes a wide variety of records such as land related documents, wills, Loyalist petitions, census information, court papers, church registers and vital statistics including marriage, birth, and death records; school papers, genealogies, clippings and notes taken from various newspapers and periodicals, photographs and negatives, correspondence, postcards, and diaries. The records within the fonds shed light on the history of Ship Harbour and its families, the work of Annabel Ells, her personal life from a young girl growing up on the Eastern Shore to travelling as a young woman and attending school, entering into various careers, living as an independent woman in the early 20th century, her marriage later in life and her lifelong interest in her Ship Harbour home. The records were transferred to the Eastern Shore Archives from Nova Scotia Archives and Records Management on March 8, 2011. Records had been arranged prior to their transfer to the Eastern Shore Archives and that original order has been maintained. Some duplicate records have been weeded. Some records are reproductions copied by Annabel Ells, the originals of which are located at Nova Scotia Archives and Records Management (NSARM). Many original negatives belonging to the Annabel (Siteman) Ells fonds remain housed in cold storage at Nova Scotia Archives and Records Management for preservation purposes as the Eastern Shore Archives does not currently have a suitable storage option available on site. A content list of the negatives does exist within the holdings at the Eastern Shore Archives that can be referenced. The items include negatives from Volumes 1036 (1920-1935), 1037 (1936-1950), and 1038, and are housed at NSARM under the Ells Collection, MG1-Vol. 1036, Freezer Box 15 & 16; MG1-1037, Freezer Box 16 & 17; MG1-Vol. 1038, Freezer Box 18. Copies of some records are available on microfilm. Scanned copies of some photographs are available, with all relevant photographs to be digitized over time. Copies of newspaper clippings of relevance to the Eastern Shore have been made and placed in the vertical files in the Reading Room, particularly files from Volumes 1017, 1018, 1019. See file list. Researchers are asked to view scanned photos when possible as opposed to originals. A partial inventory of Annabel’s postcard collection, a microfilm index and finding aid is also available. Annabel Ells NSARM album box 2, Nova Scotia Archives & Records Management.